Tips for Better Writing teaches readers essential study skills to help them achieve their academic goals. It also gives advice on using these skills in everyday life to help readers gain valuable life skills and gain confidence in extra-curricular activities. Knowing how to write well can help you explain, describe, tell a story and much, much more. Writing is an important part of a student's toolbox, and it can be lots of fun. This title divides writing into three main areas that students will come across at school, writing opinion pieces, writing informational text, and writing fiction. The Student's Toolbox equips young people with the tools needed to further their studies and help them develop vital life skills, from planning their timetables through to understanding how to deliver great speeches and presentations. From writing and researching through to planning and speaking, discover how to improve the skills you need to be a grade A student. 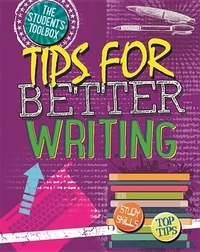 Other titles in the Student's Toolbox series include: Tips for Better Researching, Tips for Better Writing, Tips for Better Public Speaking, and Tips for Better Planning.